A powerful integrated interactive P/T/Z robotic cam system - at a very affordable price. Tiny, fast, quiet, and with 216X zoom (18X optical, 12X digital). 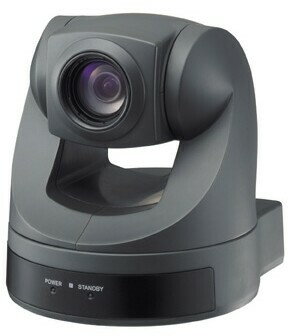 This is Sony's best 'video conferencing' camera, a replacement for the venerable EVI-D30, but with updated features like 18X optical zoom, 340-deg pan, ZERO LUX feature, switchable for hanging or upright mounting. Pan up to 340 degrees (+/- 170) up to 100deg/sec. Zero-Lux Feature: Infrared cutoff filter is switchable on/off. Switchable Tilt (+30/-100 hanging, +100/-30 upright) up to 90deg/sec. $1499.95 complete with CamMotionPro software suite for local and network-remote operation. Thank you for visiting the Videobotics CamMotionPro70 Page.